The flight plan consisted of four “laps,” elongated circuits (shaped like a paperclip) over London, Ontario airspace. Each lap was about seven to eight miles long and two to three miles wide. Three calls were made on each of two straight legs in each lap. Calls alternated between cellphone A and cellphone B. A second i1000, intended for use at higher altitudes, slipped to the cockpit floor and could not be retrieved in those cramped quarters. A check of battery levels of the first i1000, however, showed that there had been no significant power drain on the unit. Note: “altitude” means aboveground altitude, not height above sea level, as recorded by the altimeter. Summary: In the preliminary test, only five of the 16 (attempted) calls resulted in any meaningful voice contact. In at least two of those calls, no connection whatever could be established with cellsites below. The composition of the Diamond Katana (manufactured right here in London, Ontario) makes it almost transparent to EM radiation at radio wavelengths and the results of this experiment are therefore optimal. Aircraft with metal skins will undoubtedly fare rather worse in the percentage of calls making it through. Conclusion: the purpose of this experiment was to probe the effect of altitude on cellphone service and to iron out wrinkles in experimental procedure. In the first instance, it looks as though there might well be a decline in service with increasing altitude. The phenomenon must now be mapped more carefully. Plans are now under way for part two (Below). This will involve a Cessna four-seater (with an aluminum skin), five or six cellphones of various types, an expert to operate them on my queue, and a flight plan that will explore the effect up to 10,000 feet beyond which, according to one airline pilot, there is absolutely no hope of getting through. Both the Telus Mike (C1) and Motorola StarTac (C2) operate in the 800 MHz range. This will allow the signal to travel at a great distance. However, the IDEN (Mike) network has fewer site locations and is a newer Digital network. Most digital technologies operate on a “all or none” basis. When it has signal it will work well. As the signal fades, one hears no static, but some digital distortion just before the call drops. During the early months of the year 2003, the author conducted three experiments to determine whether and how well cellphones could be operated from aircraft. The first flight (Part One) was essentially a probe of the experimental situation, to acquire some primary data and to work out a simple, readily implemented protocol. The results of Part Two (Diamond Katana 4-seater) have already appeared in these pages. The results of Part Three (Cessna 172-R) appear immediately below. Since this completes the suite of experiments, it is appropriate to summarize the findings and to draw some conclusions. The conclusions are based partly on the experiments and partly on two other sources. (See Appendix B at the end of the report.) Expert opinion and eyewitness testimony are acceptable not only in court, but in certain scientific inquiries where events are of short duration or experiments are too expensive or impossible to carry out. Of course, eyewitness accounts do not carry the same weight as expert opinions or actual experiments, but the eyewitness accounts quoted below seem to be both consistent and compelling. Disclaimer: The companies hired to assist in this experiment, namely Empire Aviation and Cellular Solutions, both of London, Ontario, Canada, acted as disinterested commercial parties, with no stake in the outcome or even knowledge of the purpose of the tests. The previous experiment, called Part Two, established a distinct trend of decreasing cellphone functionality with altitude. It was conducted in a four-seater Diamond Katana over the city of London (pop. 300,000), Ontario in Canada, an area richly supplied with some 35 cellsites distributed over an area of about 25 square miles. The flight path was an upward spiral, punctuated every 2000 feet (abga) with a level circuit around the outskirts of the city. On each circuit a fixed number of cellphone calls were attempted by an expert operator employing a battery of well-charged phones broadly representative of those on the market both currently and in the year 2001. The purpose of Part Three was to test the effects of what might be called “Faraday attenuation” on the strength and success of calls. The presence of a metallic shell around some electronic devices can alter their behavior by its ability to attract and store electrons, especially electromagnetic waves. For this reason, the experimental craft was switched from the Katana, which is supposed to be relatively transparent to em radiation, to an aircraft with an aluminum skin, as below. Weather: unlimited ceiling, light scattered cloud at 5,000, solid/broken 24,000 feet, visibility 12 miles, wind 11 knots from SSW, air temperature +19 C.
For this experiment, we flew the same circular route as we did in Part Two, The circle centered on the downtown core and took us over most of the city suburbs. All locations below are referred to the city centre and are always about two miles distant from it. At times specified by the director, the operator made a call to a specified number, stating the code number of the cellphone (1 to 5) and the altitude. The ground recorder noted whatever was heard and the time the call was received. At the first two altitudes of 2000, 4000 above ground altitude (abga) each cellphone was used once. At 6000 and 8000 feet abga, each cellphone was used twice only C2, C3, and C5 were tried, C1 and C4 being hors de combat. Note: calls “tried” includes retired cellphones C1 and C4 above the altitude of 4000 feet where, in the opinion of the cellphone expert, they would have failed to get through, in any case. Failure to include them in the count would make the results at different altitudes non-comparable. To make the results comparable, however, cellphone C5 was omitted from the calculations, since it was not used in the first experiment. It will be noted that the values of k implied by these data, at least up to 6000 feet abga are remarkably consistent. However, at 8000 feet the k-value falls precipitously, implying that a different regime may be in play. At 4000 feet abga the implied k-value if 7,040,000, while at 8000 feet, the implied k-value is 5,760,000. although here again the k-value appears to drop (indicating that the actual attenuation may be worse than inverse squared), we use an average of the two estimates, following our consistent practice of always giving the benefit of the doubt to the cellphones, so to speak. Using this formula, we can get a best-case estimate for the probability of cellphone success from a slow-moving light aircraft, as summarized in the following table. Private pilots flying light aircraft are nowadays familiar with the fact that they may use their cellphones to make calls to the ground, at least if they are not higher than one or two thousand feet. Above that altitude, calls get rather iffy, sometimes working, sometimes not. The higher a pilot ascends, the less likely the call is to get through. At 8000 feet the pilot will not get through at all unless he or she happens to be using a cellphone with the same capabilities as C5 (See appendix A.) But even that cellphone begins to fail at 6000 feet. Calls from 20,000 feet have barely a one-in-a-hundred chance of succeeding. The results just arrived at apply only to light aircraft and are definitely optimal in the sense that cellphone calls from large, heavy-skinned, fast-moving jetliners are apt to be considerably worse. It cannot be said that the Faraday attenuation experiment (Part Three) was complete, in the sense that the operator normally held the phone to his ear, seated in a normal position. This meant that the signals from the test phones were only partially attenuated because the operator was surrounded by windows that are themselves radio-transparent. Although we cannot say yet to what degree the heavier aluminum skin on a Boeing 700-series aircraft would affect cellphone calls made from within the aircraft, they would not be without some effect as windows take up a much smaller solid angle at the cellphone antenna. Signals have a much smaller window area to escape through, in general. This assessment is borne out by both earwitness testimony and by expert opinion, as found in Appendix B, below. Taking the consistency of theoretical prediction and expert opinion at face value, it seems fair to conclude that cellphone calls (at any altitude) from fast-flying aircraft are no more likely to get through than cellphone calls from high-flying slow aircraft. The author has not placed his university affiliations below his name, as the research described here was not conducted with any university facilities or supported by university-administered grants. He currently holds the titles of Professor Emeritus of Computer Science and Adjunct Professor of Biology at the University of Western Ontario, as well as Professor of Computer Science at the University of Waterloo. I have yet to read the entire [Ghost Riders] article but I do have a background in telecommunications. Using a cell phone on an air craft is next to impossible. The reasons are very detailed, but basically the air craft would run major interference, as well as the towers that carry the signal would have a difficult time sending and receiving due to the speed of the air craft. As well, calling an operator? Well that is basically impossible. Having worked for both a major Canadian and American provider I had to instruct my staff that operator assistance is not an option. Have you ever tried to use a cell phone in some public buildings? Impossible. There are too many spots that service is voided. Just a tidbit of information to share. I am an RF design engineer, having built out Sprint, Verizon and another network in New Orleans. You are absolutely correct. We have trouble making these things work for cars going 55 mph on the ground. If you need another engineer’s testimony for any reason, let me know I will corroborate. Yours is the first article I’ve read which focuses on those dubious ‘cell phone calls’. Last month my Wife and I flew to Melbourne, about 1000 miles south of here. Cell phones are Verboten in Airliners here, but on the return journey I had a new NOKIA phone, purchased in Melbourne, and so small I almost forgot it was in my pocket. I furtively turned it on. No reception anywhere, not even over Towns or approaching Brisbane. Maybe it’s different in the US, but I doubt it. There has to be an investigation into this crime. Justice for the thousands of dead and their families demands it. I have repeatedly tried to get my cell phone to work in an airplane above 2-3000 feet and it doesn’t work. My experiments were done discreetely on [more than] 20 Southwest Airlines flights between Ontario, California and Phoenix, Arizona. My experiments match yours. Using sprint phones 3500 and 6000 models, no calls above 2500 ft [succeeded], a “no service” indicator at 5000 ft (guestimate). There seem to be two reasons. 1. the cell sites don’t have enough power to reach much more than a mile, 2. The cell phone system is not able to handoff calls when the plane is going at more than 400 mph. This is simply experimental data. If any of your contacts can verify it by finding the height of the Pennsylvania plane and it’s speed one can prove that the whole phone call story is forged. I write in praise of your report, as I have felt from day one that the cell phone ‘evidence’ was perhaps the flimsiest part of the story, and am amazed that nobody has touched it until now. Responding to your article, I’m glad somebody with authority has taken the trouble to scientifically prove the nonsense of 9/11. Based on this, I can support you in your findings that the official (perhaps fabricated) stories can be categorised as nonsense. flying at over 30,000 ft at speeds of over 500 MPH. altitudes at which I made my attempts. I.e., at less than 2,000ft AGL. and documented paper re slow-flying light aircraft at low altitudes. I do not pretend to be any sort of expert of cellular communications, but I am an electronics engineer and hold both amateur and commercial FCC licenses, so I do have some understanding of the relevant principles of radio communication systems. I read with interest your analysis of terrestrial contact probabilities via cellphones from aircraft. I believe your conclusions are sound, but would like to comment on an element which you pondered regarding the sort of apparent discontinuity in what seems otherwise to be an inverse-square relation beyond a certain altitude. Cellphones operate by Frequency Modulation, and as such the (apparent) signal strength is not discernible to the listener because the intelligence is contained only in the frequency and phase information of the signal before demodulation. Hence, the system works pretty well until it is so weak that it is abruptly lost. That is, the system can no longer “capture” the signal. It does not get louder and softer with signal strength -until the signal is below the detection level of the receiver, at which point it is essentially disappears. The cellphone also adjusts the transmit power according to the signal level received at the tower end of the link. Once it is at maximum output, if the signal diminishes beyond some minimum threshold depending on the receiver design, it is lost altogether and not simply degraded in quality. Analogous behavior is experienced with FM broadcast stations; as you travel away from the transmitter the station is received with good fidelity until at some distance it rather suddenly cannot even be received any longer at all. Additionally, cellphone towers are certainly not optimally designed for skyward radiation patterns. Since almost all subscribers are terrestrial that is where the energy is directed, at low angles. In summary, if your observed discontinuous behavior is real, and I believe there is technical reasoning for such, the probability of making calls beyond some threshold altitude is not simply predictably less, but truly impossible with conventional cellphones under any condition of aircraft etc. because of the theoretical limits of noise floor in the receiving systems. I think the plausibility of completing the calls from 30,000+ ft. is even much lower than might be expected from extrapolations of behavior at lower altitudes which you investigated. Thank you for your thoughtful work in this area. I too can verify that on a private charter airline, Champion Air, which was a 737-300, I believe that is correct or it might have been a 727-300. But regardless of that, we took off from Dallas/Ft. Worth International Airport at 0735 in July of 2003. As we were taxiing to the run way the pilot told us to please turn off all electronic equipment, i.e. Cell Phones, Laptops, etc. I did so, but shortly after take off and before the pilot said we could use our “electronic equipment” I thought I would call my mom and let her know we were in the air. We had not been off the ground for more than 2 minutes. I would guess between 2000 and 5000 ft. I was using at the time one of Motorola’s top of the line phones, a V60t. My cell phone carrier is Cingular which is quite a widespread carrier as you probably know, I had absolutely no signal at all. Since we were flying to Cozumel, Mexico I kept trying and watching for a signal until we got out past the coast line of Texas, when then I knew for sure I wouldn’t get a signal again until we landed in Cozumel. 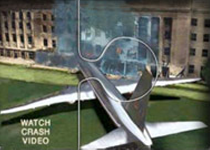 Again in June 2004 we flew out of DFW, same airline, same type of plane, and the same thing occurred. This time I left my phone on from take off and up until it lost the signal. Again we couldn’t have been more than 2000 to 3000 ft. off the ground. I lost the signal and never again got a signal until the plane landed in Cozumel. I find it highly unlikely that anyone could have used a cell phone on 9/11/01 at above 2000 feet. I’ve been using Nokia phones with automatic nationwide roaming, and Cingular before it was Cingular and long before 9/11. I confess to having turned my cell phone on while flying commercial airlines several times prior to 9/11, just to see if signals were available. At 2,000 feet the phone went totally flat. No calls out or in were ever possible. Of course all these stories are anecdotal, but according to cell phone engineers who have cared to comment have stated that commercial aircraft fly far too fast and far too high to expect that folks on flight 93 ever managed to get a call out on their own phones. They’ve said that the towers can’t transition or hand over private cell phones fast enough. I hope we can hear from other ATPs on this subject.